The ocean is a mystery, and is home to some pretty terrifying beasts that more closely resemble aliens than creatures of this planet. And news out of Huntington Beach, California on Wednesday confirms this notion to be more fact than myth. 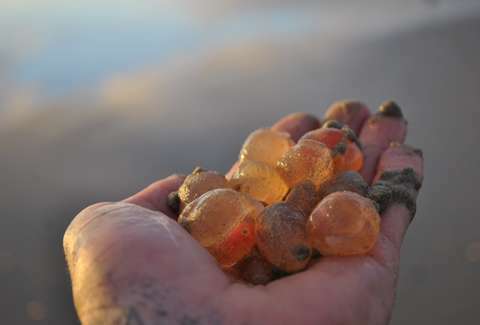 Ryan Rustan was walking on the beach on Monday when he encountered scores of gelatinous creatures lining the sand. The translucent animals looked mysterious, so he posted some pictures on Facebook, where many other people have asserted their own speculation. According to reports from KTLA and The Orange County Register, there were thousands of them, all of which resemble minuscule, glowing orbs. Rustan told KTLA that the mystery creatures were scattered "all over" the beach. And people on the internet weren't the only ones baffled by the event. Huntington Marine Safety Lt. Claude Panis, a veteran lifeguard with 38-years experience, was also dumbstruck. “I’ve never seen anything like that before, it looks odd,” he told the OC Register. But, doing its due diligence, the Register posited the question to an actual scientist -- the kind of person who's there to answer confounding ecological questions when Facebook can't. Matt Bracken, professor of Ecology and Evolutionary Biology at the University of California, Irvine, claimed the creatures are probably Salps. “These marine invertebrates look sort of like jellyfish, but they are actually more closely related to vertebrates (e.g., humans) than to other invertebrates,” he wrote to the paper in an email. Salp invasion or not (but let's be honest, they're Salps, as confirmed by an actual scientist), the occurrence is still quite mysterious. As Panis told the paper, "There's all kids of weird things happening, it's just strange."